The nonet developed at Michaël Attias’s Stone Residency in August 2018. At its core, the group is the trio of John Hébert, Satoshi Takeishi, and Attias, which has performed and recorded three albums since 2003 under the name of Renku. The remaining members have all been drawn from Attias’s many groups and collaborations over the years. These players, among the most rhythmically advanced and inventive in the world, are also timbral wizards and passionately lyrical improvisers, painters in sound that fill the spaces of an ensemble with liquid light and color beyond any such closed terms as solo or ensemble playing. Michaël Attias is a saxophonist/composer based in New York City since 1994. 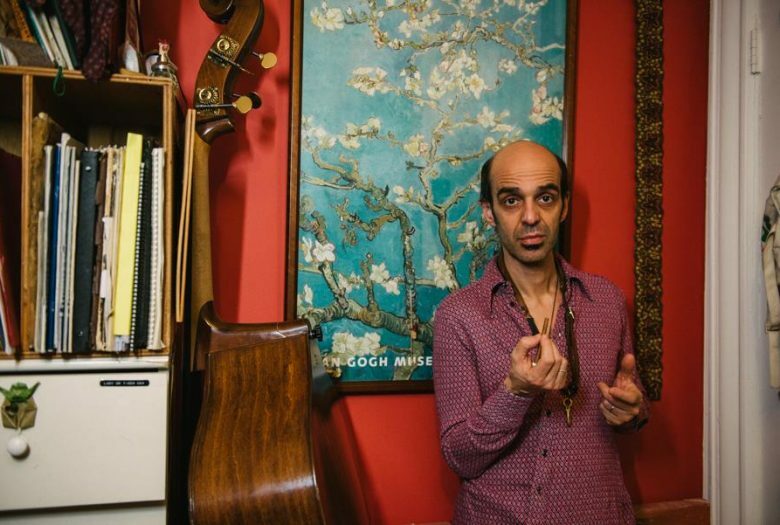 As a leader, he has released seven critically-acclaimed albums, most recently the 2017 debut of the Michaël Attias Quartet, Nerve Dance, with Aruán Ortiz, John Hébert, and Nasheet Waits. As a sideman, he has performed and recorded all over the world alongside some of today’s most original and compelling musicians, including Anthony Braxton, Paul Motian, Masabumi Kikuchi, Anthony Coleman,Tony Malaby, Ralph Alessi, Oliver Lake, and many others. Attias has also composed and designed sound in New York and at various regional theatres. He was named a 2000 Artists’ Fellowship Recipient of the New York Foundation for the Arts and was awarded MacDowell Arts Colony fellowships in Fall 2008 and Summer 2016. In his two decades as an integral member of the thriving improvised music community of New York City, saxophonist and composer Tony Malaby has emerged as a wholly unique and singular voice. Malaby was recently named one of Downbeat’s “80 Coolest Things in Jazz”, saying that, “[Malaby] is a formidably accomplished soprano and tenor saxophonist with enviable tone and an endless font of compelling ideas, yet he steers his music away from perfection,” and that “his considerable gifts as a melodist tend to sneak up on you.” Jazztimes added that Malaby is, “a hero of today’s improvised music scene”. This outpour of praise is unsurprising given the number of projects which Malaby has been involved with since his arrival in New York in the early-1990s. In recent years, Malaby has led and recorded many of his own projects–his Tamarindo Trio with Nasheet Waits and William Parker, TubaCello with John Hollenbeck, Chris Hoffman and Dan Peck and Palomo Recio with Ben Monder, Eivind Opsvik, Nasheet waits. Malaby is also a stalwart sideman and has lent his talents to such groups as the Paul Motian Electric Be-Bop Band, Charlie Haden’s Liberation Music Orchestra, Fred Hersch’s Quintet, Chris Lightcap’s Bigmouth, Eivind Opsvik’s Overseas and Ches Smith’s These Arches. Trumpeter/Composer Ralph Alessi was born in San Francisco,CA, the son of classical trumpeter Joe Alessi and opera singer Maria Leone. After taking degrees in jazz trumpet and bass—he studied under the legendary Charlie Haden at CalArts—he lit out for New York, where he swiftly became an ubiquitous presence on the downtown scene. He’s been a frequent collaborator with such notable musicians as Steve Coleman, Jason Moran, Don Byron, Ravi Coltrane, Fred Hersch, Uri Caine, and Marc Copland. Alessi has recorded nine albums of original compositions which draw on everything from post-bop to neo-classical music. He currently records for the ECM record label including his 2016 release Quiver. As an educator, Ralph is an Assistant Professor of Jazz Studies at the University of Nevada- Reno as well as the director of the School for Improvisational Music. Jacob Sacks is a pianist, composer, and educator who has been a mainstay of New York City’s creative music scene for over 20 years. He has been hailed as “a pianist of exploratory temperament, drawn to open space and shrewd irresolution” by Nate Chinen in the New York Times. Known for his creativity, ingenuity, and musicianship, Mr. Sacks has been heard in a wide variety of settings ranging from the open approach of Paul Motian’s groups to the mainstream jazz traditions of the Mingus Big Band to the eclectic world of the Hank Roberts Sextet. His new album, “Fishes,” was released in September on Clean Feed Records and features Ellery Eskelin, Tony Malaby, Michael Formanek, and Dan Weiss. Fred Lonberg-Holm enjoys working with a wide variety of musicians in as many situations as possible. Current and ongoing projects include Stirrup (with Charles Rumback and Nick Macri), Friction Brothers (with Michaels Colligan and Zerang), The Boxhead Ensemble, The Sync (with Eve Risser and Mike Reed), The Fast Citizen’s, Ballister, Joe McPhee’s Survival Unit III, Party Knüllers (w/ Ståle Solberg), MArs William’s XmarsX, as well as numerous one off projects. Past ensembles of note include the Brötzmann Chicago Tentet, Anthony Coleman’s Self Haters Orchestra, the Vandermark Five, Ken Vandermark’s Frame Quartet, Seval, and Terminal 4. Improvisors he has worked with include Clare Cooper, Charlotte Hug, Andrea Neumann, Sofia Jernberg, Jaimie Branch, Shelly Hirsch, Tomeka Reid, Michiyo Yagi, Carrie Shull, Jodi Gilbert, Gunda Gottschalk, Carrie Biolo, Birgitte Uhler, Rachel Wadham, Mary Halvorson, Joelle Leandre, Joanne Powers, Zeena Parkins, Judy Dunaway, Lotte Anker, Tine Asmundsen, Jessica Pavone as well as a number of guys. He also leads a revolving cast large ensembles under the name Lightbox Orchestra. His extensive discography includes free improvised and free jazz recordings as well as new music, pop, rock and noise. John Hébert, bassist, was born in New Orleans, Louisiana and currently resides in New York City, where he has become a highly in-demand bassist. He has worked alongside such artists such as Andrew Hill, Lee Konitz, Paul Bley, John Abercrombie, Kenny Wheeler, Paul Motian, David Liebman, Uri Caine, Greg Osby, Bill Stewart, Marc Copland, Fred Hersch, Benoit Delbecq, Maria Schneider, and many others. He has received high praise for his compositions and individual playing style. In 2011 John won the Downbeat Jazz Critics Poll as “Rising Star Acoustic Bassist.” Since then, he has released 4 recordings under his own name. For the Clean Feed label, “Spiritual Lover” and “ Floodstage”. On Firehouse 12 records, “Byzantine Monkey” and his latest release on Sunnyside Records, “Rambling Confessions”. A native of NYC, Eric McPherson came to prominence apprenticing with legendary saxophonist and educator, Jackie Mclean, and innovative pianist and composer Andrew Hill. Those foundational experiences cultivated Eric into one of the leading drummers in contemporary creative music. Eric continues the legacy of the musical giants who came before him. As well as performing and teaching internationally with an array of today’s leading contemporary creative musicians, Eric teaches privately and at the University of Hartford’s, Jackie Mclean institute. Satoshi Takeishi, drums, percussion, is a native of Mito, Japan. He has been living in New York since 1991 and he has performed and recorded in vast variety of genre, from world music, jazz, contemporary classical music to experimental electronic music with musicians such as Ray Barretto, Carlos ‘Patato’ Valdes, Eliane Elias, Marc Johnson, Eddie Gomez, Randy Brecker, Dave Liebman, Anthony Braxton, Mark Murphy, Herbie Mann, Paul Winter Consort, Rabih Abu Khalil, Erik Friedlander, Ned Rothenberg, Michaël Attias, Shoko Nagai, Paul Giger, Toshiko Akiyoshi Big Band, Ying String Quartet, Metamorphosen Chamber Orchestra, Dhafer Youssef, Lalo Schifrin and Pablo Ziegler to name a few. He continues to explore multi-cultural, electronics and improvisational music with local musicians and composers in New York.